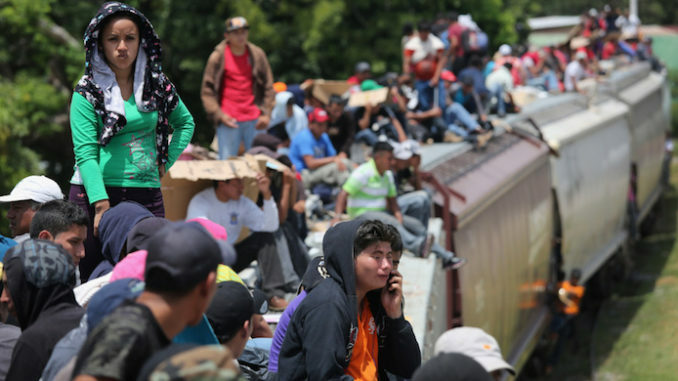 Five million illegal Latino immigrants are planning to migrate to the United States in the next 12 months, and roughly 42 million more say they want to enter the country. Breitbart.com reports: The poll came as Democrats began using their new political clout to try to widen the catch-and-release loopholes in President Donald Trump’s border defenses. Democrats say the DHS does not need so many detention beds but instead can release and track migrants or resident illegals by using “Alternatives to Detention,” such as monitors strapped to migrants’ ankles. Democrats also argue that migrants who bring children should not be detained. If that rule is adopted by Congress, all migrants who bring children to the border would be quickly released into the U.S. jobs market. Without the necessary detention authority and sufficient funding for family beds to enable ICE to detain family units when they are ordered removed, ICE will still only be able to remove a very small percentage of family units, thereby increasing the pull factors and further contributing to the border crisis. For example last year, only one percent of all removals were on ATD, at a cost of $72,000 per removal. The Republicans on the DHS funding panel include Sens. Richard Shelby (AL), Shelley Moore Capito (WV), John Hoeven (ND), and Roy Blunt (MO), as well as Reps. Kay Granger (TX), Chuck Fleischmann (TN), Tom Graves (GA), and Steven Palazzo (MS). The Democrats on the panel are Sens. Patrick Leahy (VT), Richard Durbin (IL), and Jon Tester (MT), along with Reps. Nita Lowey (NY), Lucille Roybal-Allard (CA), David Price (NC), Barbara Lee (CA), Henry Cuellar (TX), and Pete Aguilar (CA).